As a second home owner in Spain I have closely followed the development and fortunes of the SEAT car range, undoubtedly with much greater interest after the Volkswagen acquisition and observed the creation of the state of art factory outside Barcelona from the first foundations to a fully operational situation. I have been immensely impressed in what I have experienced. I have to admit being a bit puzzled by some developments, where a number of SEAT’s body designs were indicative of a MPV, diverting from a growing image had originally been established to one that broke the mould. I could see neither rhyme nor reason. Both the original Leon and the Toledo represented serious contenders in their respective classes, the former as a compact hatch back, the latter as a junior executive vehicle but the lifestyle MPV-like vehicles represented by the Altea and the second generation Toledo appeared to me to be out of kilter. Just recently I have driven both the new third generation versions of the Leon and the Toledo and I must admit I am very impressed with what I found. Yes, SEAT has a duo of products that are back on track and have the credentials to carve larger slices in two very competitive market sectors. Here I concentrate on the new Leon and will report in depth on the Toledo in the very near future, thus providing early comment on both a purposeful compact hatch back and also on a car that looks like a saloon but is actually a hatch back. Wisely, SEAT actually produced an original Leon model for me to examine, reminding me that the Leon in first and second generation versions actually remained true to the original design and it took only a cursory glance to see that the DNA has continued to be retained, the new Leon (and Toledo) also showing strong familiarity with the smaller and immensely successful Ibiza range. Visually, the new Leon is more dashing than the original design, sporting in looks without going over the top and, I am sure, has more than a touch of Latin charm about it. As with its immediate predecessor the five-door body suggests a three-door coupe but the rear door handles are no longer hidden in the rear window uprights – perhaps for the benefit of those who couldn’t find them! Here is a practical five-seat compact hatch back that is strong on interior space and comfort, offers a passable luggage capacity and the proven driving and handling qualities provided by a state-of-the-art platform that is also seeing service with several other highly rated products from the Volkswagen Group. This Leon is also considerably lighter than its predecessor. There’s no shortage of choice when it comes to power units (with more to follow), the range starting with 1.2, 1.4 and 1.8 petrol units and 1.6 and 2.0-turbo diesels with a choice (according to engine) of 6-speed manual and 6/7-speed selectable automatic transmissions. Specification choice is S, SE and FR. First time out I have gone for the 1.4 TSI version in top FR specification that I feel will be a strong choice with drivers undertaking varied driving situations from short runs to long cruises. With 140 ps (139 bhp) output from its turbocharged petrol unit that drives through a really positive acting 6-speed manual gearbox, this example has sufficient power to fully exploit the impressive road grip and responsive controls. The driving character has a good measure of flair though in a well mannered way and with excellent driver comfort, acceptable vision (LED side/tail lighting features on some models) and a notably businesslike facia. SEAT is getting increasingly performance orientated and it claims this one is good for 131 mph and can reach 62 mph (100 kph) from rest in a mere 8.2 seconds while returning a combined fuel consumption figure of 54.3 mpg (say about 45 mpg in real terms) which, despite the snow and ice during part of my test drive, suggested that it could closely live up to its maker’s claims. Importantly, the turbo engine delivered in a smooth and quiet manner. I also got the impression that the car, fitted with sports suspension as part of its package has the potential for seriously high performance with extreme competence. There is a lot of car here, the product quality is up there with the best, the equipment package across the board is mightily competitive and bristles with technology and practical thinking. 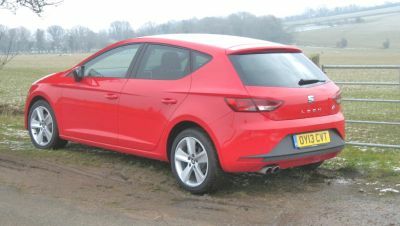 With a Coupe and a Sport Wagon range coming in the near future the latest Leon is a pointer that the SEAT brand is on the march. Watch this space! Price from £19,385 – as tested £20,790. MAIN RIVALS: Peugeot 208, Ford Focus, Vauxhall Astra, VW Golf, Citroen C3, Renault Megane, Fiat Bravo, Honda Civic, Kia Ceed. British consumers bought more cars last month than in any May since 2005, and overall car sales including company fleet purchases rose 11% on a year ago, adding to signs the economy is getting going faster than its European peers. The Society of Motor Manufacturers and Traders (SMMT) confirmed that May marked the first time that monthly car sales to private buyers have exceeded those for the same month before the 2008 financial crisis. UK car sales have performed much more strongly than in most of the rest of Europe, and over the past year have defied a generally gloomy picture for consumer demand in Britain, helped by cheap finance and other factors. Total new car registrations reached 180,111, up from 162,888 in May 2012, of which cars registered for private buyers accounted for 84,202.